Possible limitations: a possibility that he/she will be more inclined to create new ideas instead of focusing on implementing current tasks. Possible limitations: a possibility that he/she will need to obtain clear directions regarding implementation of tasks, next steps, goals in order to maintain effectiveness. Possible limitations: a possibility that he/she will focus too much on a project’s details and losing sight of the original goal. Possible limitations: a possibility that needs will not be properly balanced and priorities will not be properly set out. Possible limitations: a possibility that he/she expects too much from others or overestimates potential benefits/solutions. 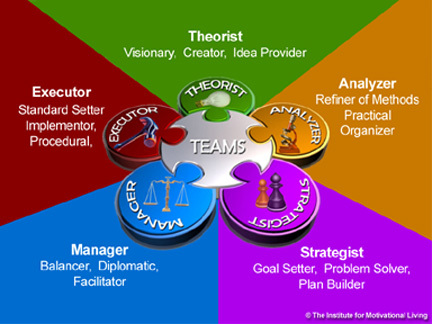 TEAMS is a part of D3 (DISC/TEAMS/VALUES/BAI) assessment, which is possibly the most sensitive competence diagnosis tools in the world, as it combines 4 analysis: DISC (behavior styles), TEAMS (team roles), VALUES and BAI (internal motivations).